This is a discussion on Spin & go within the online poker forums, in the Poker Rooms section; Played about 10 spin & go tournanents at ps, and every time it was for 2$!! How often does other prizes come?? Played about 10 spin & go tournanents at ps, and every time it was for 2$!! How often does other prizes come?? This is normal, most of the time you will have x2. As for me spin&go is like a lottery, there are so little chances to win a really big price. Id rather advice you to play mtts, if you want bigger prices. Its only my opinion. Good luck! I use them to top my BR up, I might play a few $3-$5 SnG and if I don't cash in them I play 1 or 2 and get my BR back to where it was before the losses, I may lose a couple and then hit a couple of 6x game and I'm back to where I was. The probability of spinning 10 $2 games in a row is about 4.6% ((73518/100000)^10), so albeit unlikely, you'll still hit such a streak about 1 out of every 20 sets of 10 games played. Spin n Go is a waste of time. Its so small chance to win higher pots. Tried it 2 months and nothing. Someone won the jackpot in Spingo PokerStars? As far as I understand it's logic, the first jackpot winner will occur when the game will earn enough money from players to "pay" this prize. It's like casino program set to do it usually. Programmers inside of company made it like this to not lose a single cent of course. So I recommend to wait some time, till money will accumulate. It means, it's not based on pure luck. Luck may occur only after some amount of time when enough money is in the pot. I know who it wasn't. I once played for about 30 dollars with 3 buy in, and that's it...all prizes was lower and I played a lot of games. Seems most games return the max of 10x the buyin , still an interesting concept to spice up SNG scene which has grown stale over the years . 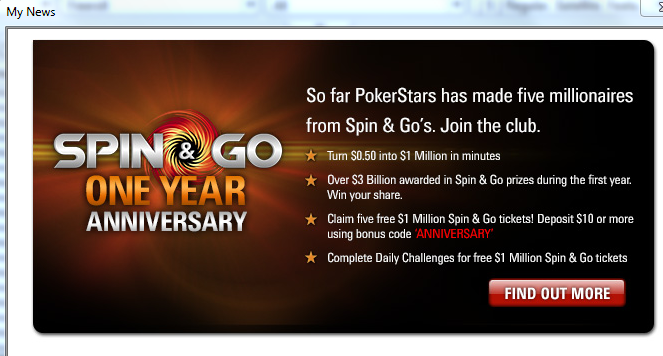 As of about three hours ago, there is one more Spin'n'Go Millionaire after being made over on Pokerstars.... Unfortunately, it wasn't me! 50c ticket, won $3. More than I expect so delighted. I always try to play the S&Gs when there's a promo running. It's a very marginal return (if any) but I think there is great value in getting some short-handed practice in. I asked ps to block my spin access! I was losing all my money tilting at those! This is a great promotion for us nickel and dimers. Just deposit a minimum of $10 and get 5 spin and go tickets. That is a 25% bonus with no play through requirements. Take note that over $3BILLION has been awarded so far. so if there take is 5% they have made $150million so far. It is a good business to be in. Then got a grasp of it and since, never played so much heads-up before. The prize pool for each game is randomly determined according to the prize schedule independent of any other games. You are just as likely to spin a million in your first game as you are your thousandth. A month coul have 20 million spins or 0. It's just the probabilities. Recall from the fist time pokerstars did the golden spin & gos, I think there were three million dollar games spun in a pretty short window iirc, which is far more than probability would've predicted. But because each individual game is random, it's possible to have so many big buyin games in a short time period. Basically what you said earlier is that the games are rigged to not pay out jackpots at first. That's a pretty big accisation. It would be very unethical and bad business too for pokerstars or any provider to rig their games like that. Perhaps such rigging is done with slots - I'm not familiar with those - but I strongly doubt that any casino of repute would rig their games in any manner, especially this one. IMO this games is still beatable,but you'll need very large bankroll=300xbuy-in at least.Maybe along the way you could strike the big jack pot and can consider it as bonus. But still I would like to read some good and meaningful profitable strategy. To keep me alive with bankroll untill I catch some big pot. Because from these games comes more points. It´s really hard to hit it!! !